Last minute write up for a last minute camp out. 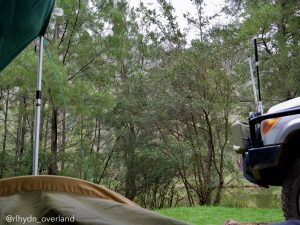 We caught up with Luke and Kaito from Drifta and a few other like minded Drifta fans for an inpromptu weekend stay at Wollondilly River Station, I had never visited and was excited to camp somewhere new. 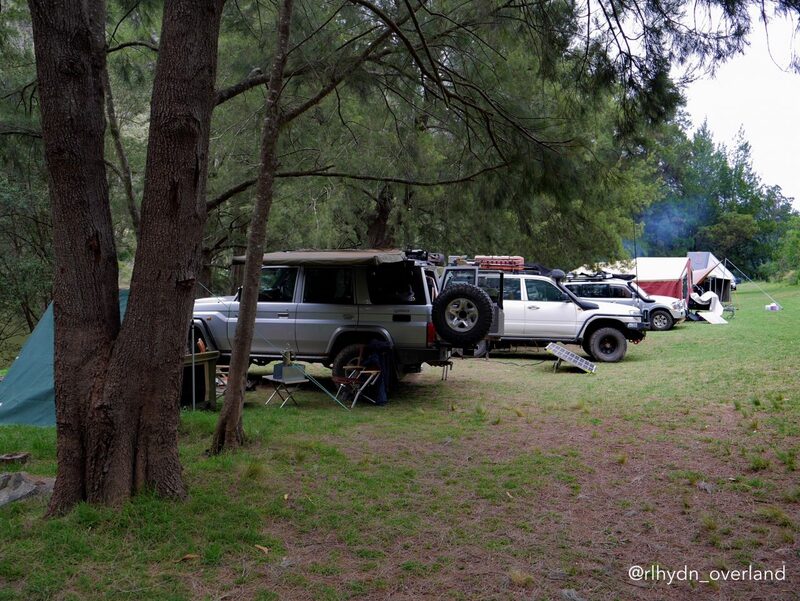 Wollondilly River Station is a privately run camping site en route to Wombeyan Caves in the Southern Highlands, NSW. It boasts grassy riverfront camping, and is dog friendly. The access is unsealed, somewhat corrugated and narrow but nothing a sensible vehicle (and driver) couldn’t handle. There are signs encouraging use of the horn on the many blind corners. I left a good old fashioned voicemail with the details of what I needed and when, and a few days later received a callback, to confirm, the price is fair at $16 per adult, school kids are less. Ina, the owner will also supply firewood upon request. 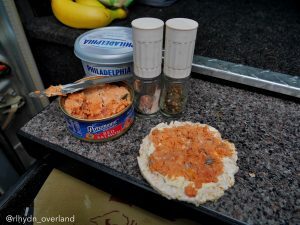 We had a bit and given it was only one night, threw it into the Drifta Firewood bag to take with us. Whilst I have visited Wombeyan Caves, it had been a few years but the road was actually in better condition, no great big rocks or potholes to avoid and literally only passed one car. The weather may have helped there, given a dry year – the road was good but on this grey Saturday, the sky threatened to drop at any minute. I don’t have an aversion of camping in the rain, provided we’re prepared for it. Scratch that, I don’t have an aversion to camping in the rain, period. But shelter and boots do add to the pleasure of it. We had packed our Drizabone coats and I was already comfortable in my Rossi boots. We opted for the swag and packed a canvas tarp for additional shelter if the rain arrived heavy. Needless to say, there was no traffic but I was surprised at how many people were already set up camping despite the poor weather prediction. Must be a good spot then? Introduced ourselves to Ina at her residence and she escorted us and another Drifta fan to our spot along the river in her trusty Subaru Brumby. We were lucky enough to see her firewood delivery service en route, split she-oak chucked from the Brumby tray to your tent (or in this case, camper van) door. Service. Our spot was flat, green and relatively weed free, also notably a minimal number of old campfire sites. 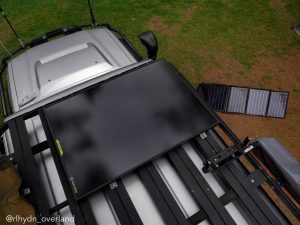 After introducing ourselves to the folks already established we picked a spot at the edge ion our casuarina grove and rolled out the swag, and pitched the canvas tarp, just in case. Firepit lit, river frontage for the swag not to mention soft green grass and it was only 11.30am, this was too good surely? A nice distance away I spotted a portaloo, vintage but inside proved clean, toilet papered and smell free, even boasting a cutting of the same climbing rose I spotted growing nearby, in a Corona bottle vase. Nice touch! The river itself is clear, deep and popular. We watched someone haul a few good fish from his kayak fishing attempts and folks swimming or rowing up and down. This spot would be amazing in the heat of summer with all the shade the she-oaks offered. There are paths throughout the vegetation and we followed these to other camping areas, some with ‘beaches’ along their frontage, some with deeper entries. Quite a few campers had their dogs and were leash free, I am not sure what the rules are but the dogs were loving it and were all perfectly well behaved. From Miniature Poodle to Husky. Only one owner I noticed ‘missed’ picking up after his, but maybe he came back for it eh? Needless to say, other than that one, I failed to see, smell or step in any rubbish or excrement all weekend. 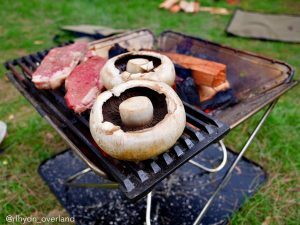 After plenty of hot tea, even hotter fire cooked corn cobs, mushrooms and steak; the palaver continued into the night around the fire pits until we retired at 10pm. The only noise of the area at night were the local fruit bat colony but this kept me awake for around 90 seconds. 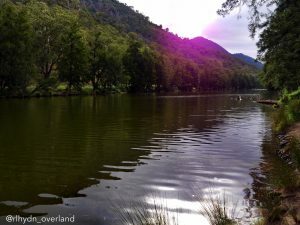 Sunday started much like Saturday, folks quietly enjoying the water whilst I enjoyed coffee with Canberra grown bacon and our homegrown duck eggs cooked on the Coleman. 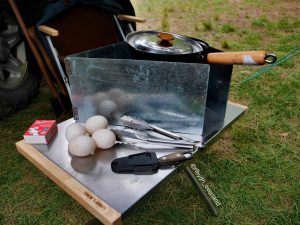 There was plenty more camping, biking, photography, bushcraft and cooking chatter amongst our group. Around 2pm we slowly packed up and headed into Moss Vale for a late lunch before heading home, our canvas therapy satiated for another weekend. And for bonus points, it didn’t rain after all, albeit the sun only made a cameo appearance. 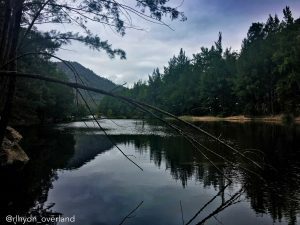 Check out Wollondilly River Station for yourself at http://www.wollondillyriverstation.com and give Ina a call to book in your waterfront camp. We will be.